Weighty Matters: Juice is NOT a F@*#$*&g Fruit! In case you're not aware, Canada's official Food Guide formally recognizes half a cup of juice as a fruit equivalent. This of course despite both the Canadian and American Pediatric Societies putting a half cup maximum on juice consumption in young children and a full cup for everyone else. 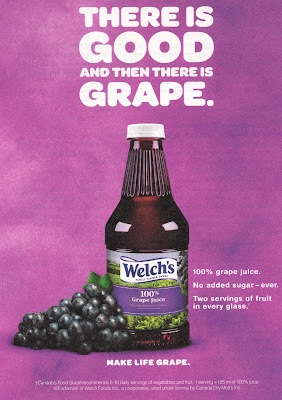 Not surprisingly juice manufacturers hone right in on the Food Guide's recommendations and use them as a means to market their products to parents like that seen on the advertisement for grape juice up above. And don't forget too, children are taught the Food Guide as gospel in grade school and it serves as the backbone of any institutional food program (including daycares and preschools). The average Canadian child between the ages of 2 and 8 is consuming 50% more than their recommended juice maximums. But that's not the whole story. Some kids are chugging tons of the stuff with the 75th percentile of 2-3 year olds drinking 2.5x as much which means 25% of Canadian preschoolers are drinking even more than that! Juice is sugar water with vitamins. It has drop per drop the same amount of sugar as soda pop and in some cases more (like that grape juice which has double the sugar of Coca-Cola - 10 staggering teaspoons a glass). Liquid calories don't satiate, and they don't pack the fibre and phytonutrients of actual fruit. So do you think the Food Guide's inclusion of juice as a fruit, or to put it differently the Food Guide's failure to admonish against juice consumption might have something to do with its consumption among Canadian preschoolers? I sure do. And while it's not true causal proof, looking to Australia, a country where their Food Guide explicitly discourages juice consumption and sets the same half cup maximum as the Canadian and American Pediatric societies, my read of this report has their average 2-3 year olds drinking only a third of a cup of juice a day.